Sweet Spa Tower encourages you to indulge in a sweet spa experience made by hand with organic and natural ingredients at home. 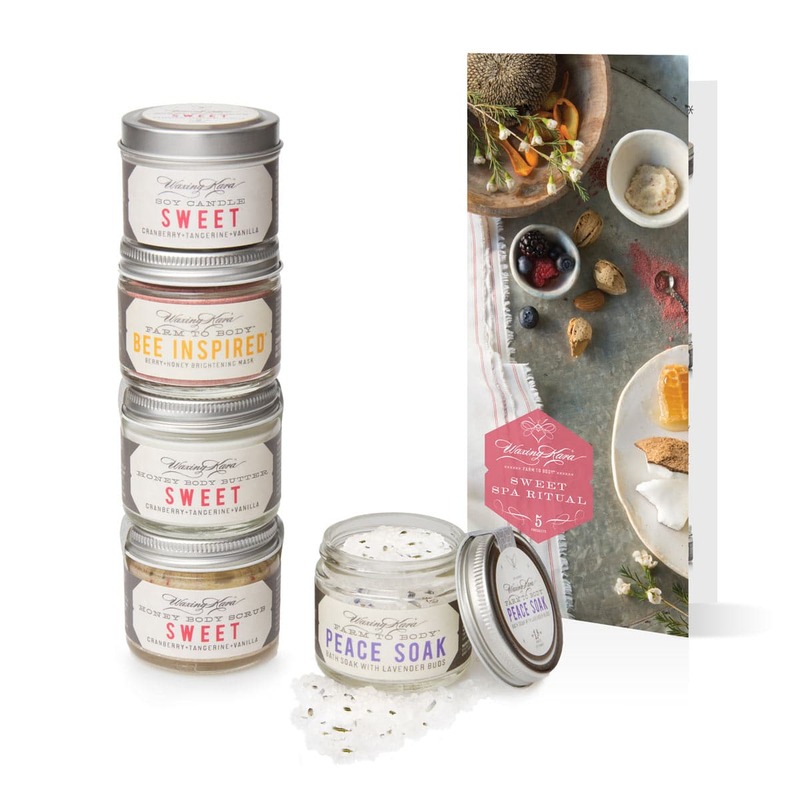 Designed to exfoliate and brighten the skin with an essential oil blend draws inspiration from sweet confections featuring vanilla, tangerine and honey. Enjoy sweet and amazing skin. Inspired by our favorite desserts, Sweet Spa Tower™ combines the sweetest products Waxing Kara has to offer. Made with only natural ingredients including honey, shea butter, and essential oils for a luxurious, healthy spa experience. 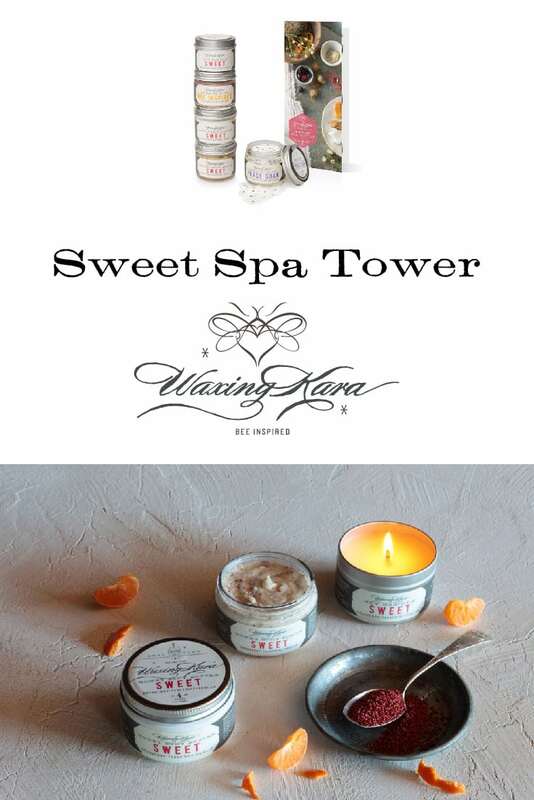 Waxing Kara’s Sweet Spa Tower is free from artificial fragrances, parabens, sulfates, and petroleum ingredients. Made in America and always cruelty-free. Sweet Soy Candle: fills the room with the fragrance of tangerine and vanilla. Peace Soak: made with dead sea salts, epsom salts and lavender flowers. Sweet Body Butter: like dipping into a jar of sweet vanilla cream butter! Richly moisturizing and nourishing. Bee Inspired Mask: packed with the antioxidants of berries, this mask renews and brightens your skin. Sweet Honey Body Scrub: made with honey crystals and cranberry seeds to gently polish the skin to perfection. Step 1 – Dry Brush the entire body to warm the skin and prepare it for detoxification. Step 2 – Soak in warm water enriched with Waxing Kara™ Peace Soak. Sodium and potassium levels are well-kept secrets to both physical health and mental well-being. They influence the fluid balance in the body, which is regulated by the Adrenal gland, which in turn affects the healthy function of the kidneys. A far-reaching domino effect is ignited in the body when sodium and potassium levels are skewed. Soaking in Dead Sea Salts helps restore balance, fortifying your well-being as they coax you into relaxation. Although Dead Sea salt is renowned for its medicinal qualities, we strongly recommended a consultation with a qualified physician before using our products for treatments of Psoriasis, Arthritis, Atopic Dermatitis, Eczema or any other skin disorder. Directions: We recommend 2 tablespoons for an average-sized bath, and a full container for an oversized tub. Simply scoop and then swirl salts into warm water. Step 3 – Cleanse and exfoliate with Waxing Kara Sweet Scrub. We’ve blended organic honey crystals with shea and cocoa butters to create a deliciously rich exfoliant system that nourishes the skin while cranberry seeds assist in sloughing expired cells to reveal the fresh, healthy tissue. Directions: Apply to skin using gentle, circular motions. Rinse with warm water or warm towels and towel dry. Step 4 –Fortify and protect with Waxing Kara Eastern Shore Farm Fresh Bee Inspired Mask. Behold the power of berries! A fresh, fully customized mask of coconut milk, strawberries, blueberries, and raspberries is painted on the body. Relax as mineral-rich clays deeply detoxify and the berry blend boosts the health of your skin, nourishing with a potent synergy of antioxidants and skin brighteners. Directions: Quickly blend a fresh, 100% natural mask targeted to your skin type. Select a mixer after examining the skin- mixing takes 60 seconds or less. Combine 2 parts mask powder to 1 part mixer and blend well. We recommend heightening the sensation by gently warming the selected mixer before combining with mask powder. Paint freshly blended mask onto skin and allow remaining for 10-15 minutes. Rinse with warm water or warm towels and towel dry. We recommend treating yourself to a petite facial with this mask or gently rub your feet and rotate your ankles as you relax as the face and body mask works its magic. Step 5 – Massage freshly cleansed skin with Waxing Kara Sweet Honey Body Butter. Lock in all of these important nutrients and seal the skin with our proprietary blend of Waxing Kara Honey, cocoa butter, and sweet almond oil. The result is skin that’s ready to put its best foot forward! Step 6 – Relax: Pour a cup of herbal tea and sweeten with our raw Eastern Shore Honey. Light our Sweet Soy Candle. Listen to inspiring music. Relax your body and mind.